Dubai Marina Mall started its operation in 2008 and is owned by Emaar Malls Group. 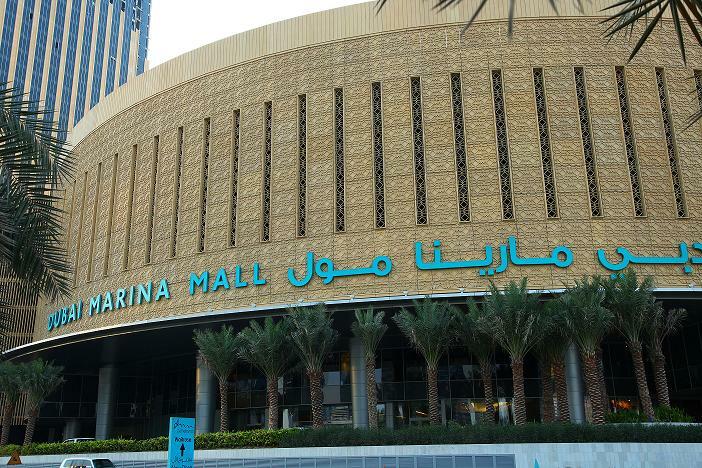 It is considered one of the best shopping destinations in Dubai. With more than 130 shops of renowned brands from across the globe, Dubai Marina Mall makes you actually want to shop. The mall is spread over a vast area of 390,000 square feet and is divided into four portions. Dubai Marina Mall is home to a variety of high street fashion brands, stirring boutique fashion, a large food court, a supermarket and other good entertainment offers. The 5-star Address Dubai Marina Hotel is also located just close to the mall. Dubai Marina Mall features the best shopping options in town. The mall has everything related to major children’s, men’s and women’s clothing and accessories, funky fashion, books, stationary & toys, home furnishing and a good selection of jewelry and leather stores. Some of the well known stores include Adidas, BALMAIN Paris, Boots Pharmacy, Diesel, Guess and Koton. Apart from shopping, there are various restaurants and coffee shops offering almost all the ingredients to cater to different tastes. From Saturday to Wednesday, the mall opens at 10 am and closes at 10 pm, while on Thursday and Friday, the operational hours of the mall are between 10 am to midnight. Since there is no metro station in the surrounding area of Dubai Marina Mall, so a visitor has to flag down a cab or go by bus.